Cracks with widths from 3mm down to approximately 0.2mm can be sealed using our resin injection systems. Major cracks in concrete, stone and masonry of up to 10mm are treated with our thixotropic anchor grout systems. We offer a wide range of solutions for the problem of perished or damaged expansion joints in car parks, bridges, tower blocks, reservoirs, factories, etc..
From a simple replacement of a poly sulphide material to a special Jeene Joint and Hypolon strip over replacement, Concrete Renovations Ltd has the answer. On discovering a crack in your concrete building you may be tempted to think that the structure is about to collapse. You may have many questions to which there seems to be no answers. Concrete Renovations Ltd intend to provide you with some basic reasons as to why concrete cracks and answer some of your questions. Most cracks occur as a result of shrinkage of concrete. Shrinkage is simply a reduction in the volume of concrete as it hardens. If this reduction in volume were unrestricted, then a crack would not occur. However, in reality, ground friction and a number of things such as structural connections inhibit free shrinkage and thus cause cracks. A 30 metre long regular-weight concrete slab normally would shrink by about 18mm. In other words, you should expect cracks totaling in widths up to 18mm in every 30 metres of concrete. Lightweight concrete shrinks more. It is important to note that concrete does crack and that this is normal. What is not normal is an unsightly and excessive amount of cracks. Not every crack threatens the structural safety of a building. In fact, in many instances, cracks are merely cosmetic in nature. These cracks are typically seen in flat work such as walkways and curbs. Sometimes such nonstructural cracks in driveways and paths become more than just an eyesore. Tree roots and impact from vehicles can cause raveling as well as vertical and horizontal offsets at the cracks. When these offsets become trip hazards, repairs are necessary. Doors and windows do not open and close easily. Vinyl flooring tears as a result of crack movement. Interior corners may develop new cracks. 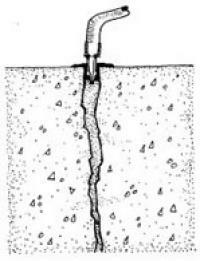 Longitudinal cracks can develop along the length of the foundation as a result of corrosion of reinforcement. This will help us when making our evaluation. As in medicine, a good diagnosis is a must for a successful cure. 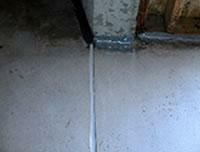 Investigating the cause of the distress in concrete is necessary in order to recommend an appropriate repair material. Also as in medicine, a variety of repair materials are available and each has a specific use. For example, some cracks are caused by movement in the structure. Repairing such cracks with epoxy could cause reoccurrence of a crack in the future at a nearby location. Use of an appropriate material and technique can not only produce savings on the cost of repair, but also can ensure a durable repair.